Credit to image used in pin goes to Rubbermaid Products and Eat Live Grow Paleo. – Changes were made to the original image. Being the most useful and helpful kitchen appliance, your fridge is a lifesaver for keeping your food from expiring. But with overtime use, your most loved appliance can get messy and disorganized. And that’s why I decided to look for some fridge hacks to make your life a little bit easier. Down below are some tips and tricks that will totally change the way you use your fridge. They’ll keep your place clean, organized, and save you so much time and money. So check them out and let me know what you think! If your fridge has slotted shelves, then definitely try using binder clips to hold up your opened snack bags or frozen veggies. Use all the empty space above to create more space underneath. Doing this will give you easy visibility on what hasn’t been used and what’s almost gone. There’s no doubt that plastic bins are great when it comes to organizing your fridge. From sorting out perishable items to different produce, condiments, snacks and more; bins can help you out so much. You can easily get some at the dollar store and use them to organize your entire fridge. Occasions and celebrations always come with large batches of cookings, and this means less space in your fridge. And if you begin to run out of space in your freezer, why not remove your freezer shelves that just eat up lot of space? Many of the shelves and drawers are removable, which opens up the space for more dishes. After gathering like items, consider labeling them for easy identification. You can print out labels, use dry erase labeling, or if you prefer handwritten, this will also do. What’s important is that you can clearly identify which is which to save time and effort. Who would have thought that by placing your condiments upside down in an egg carton, would not only make them easy to squeeze but also keep them from falling over your fridge door? I think this is the most practical way to save money and get the most out of your condiments. Get rid of your Tupperware and try mason jars when storing your leftover food. They will keep your food fresher longer, and they don’t stain. Their airtight screw top means no leaks, and they’re totally versatile. Plus, they make a great grab-and-go lunch that you can easily bring to work or school. Usually, after you’ve finished drinking your milk, you’ll throw the container out right away. But did you know that you can recycle them and make fridge containers for your small veggies like beans, peas, and corn that you regularly use? They’re easy to store and even easier to pull out when needed. They are a great alternative to plastic baggies that can easily created spills in your fridge. Want to know the perfect organizer for your frozen flat meat? Grab your old plastic magazine holders, lay them flat, and you can store several items in them. You can also store leftover soups or slow cooker recipes that are stored in a flat vacuum-sealed plastic bags. Turns out your holder aren’t just good at keeping your magazines and books in place but your food as well. Instead of buying expensive fridge liners, why not grab your press n seal wrap ? When it gets sticky and messy, throw it out. No more drink spills or sauces getting everywhere. Here’s a smart and space-saving technique that can maximize your overall fridge space. By simply adding magnets to the bottom of your small plastic containers, you store more things like nuts, spices, dried herbs, seeds and more in your fridge without using up a ton of space. Your fridge may be the least fun thing to clean in your kitchen but it’s also one of the most valuable appliances in your home. So why not take care of it and minimize the weekly or monthly cleanups? 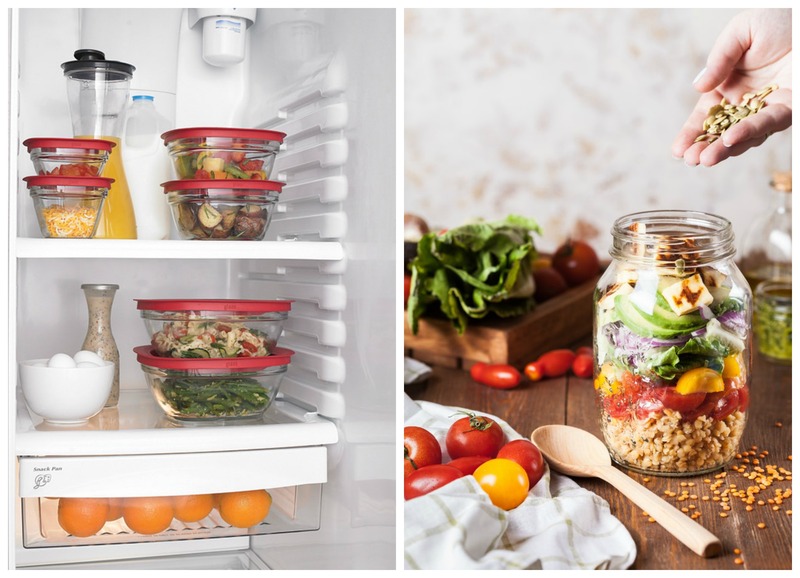 These ideas can quickly organize your fridge, so try them out and let me know what you think! Now if you have any questions, feel free to ask me in the comments below! I’d love to help you out!